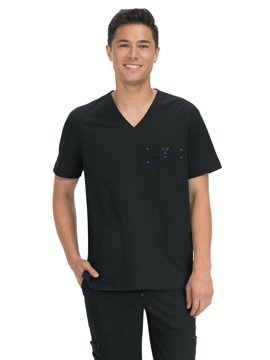 This no-pocket scrub shirt is non-reversible, and features set-in sleeves, scoop neck, and coordinating knit cuffs. **PLEASE NOTE: EXPEDITED ORDERS FOR FASHION SEAL WILL NOT SHIP OUT THE SAME DAY. THERE IS AN ADDITIONAL $5 SERVICE CHARGE FEE INCURRED FOR ALL FASHION SEAL ORDERS, REGARDLESS OF QUANTITY. THIS FEE WILL BE REFLECTED IN YOUR FINAL INVOICE. 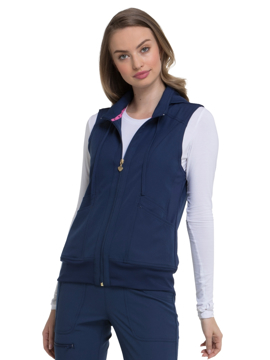 This no-pocket warm-up jacket is non-reversible, and features raglan sleeves, snap front closure, and coordinating knit cuffs. **PLEASE NOTE: EXPEDITED ORDERS FOR FASHION SEAL WILL NOT SHIP OUT THE SAME DAY. THERE IS AN ADDITIONAL $5 SERVICE CHARGE FEE INCURRED FOR ALL FASHION SEAL ORDERS, REGARDLESS OF QUANTITY. THIS FEE WILL BE REFLECTED IN YOUR FINAL INVOICE. 5 nylon cap snap closure on angled front. Welt breast pocket. Split sleeve pocket. Mesh side panels. Center back length: 29". Fashion meets performance. Purple Label workwear makes you look and feel elegant throughout the day. Our Purple Label fabric brings you "Wash and Wear" performance and durability. Look stylish in this stylized v-neck top with zipper at collar and top-loading pockets. Center back length: 25½". Fashion meets performance. Purple Label workwear makes you look and feel elegant throughout the day. 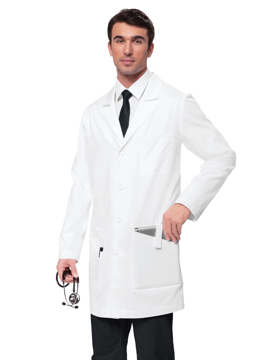 Our Purple Label fabric brings you "Wash and Wear" performance and durability. 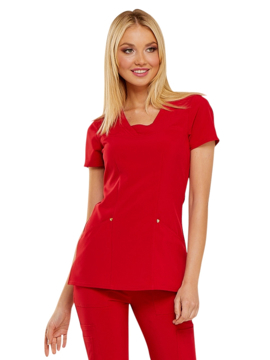 This rounded v-neck top has a slimming color block contour and side angled pockets. Center back length: 24½". Three-quarters sleeve double breasted button front dress with back tab belt. Center back length: 43½". Asymmetrical v-neckline gives this top a fun and modern feel. Two top loading pockets with two signature zippered pockets on top to hold all your gear. Angled back yoke and asymmetrical princess seam detail. Side-seam hem venting for easy all-day movement. Center back length: 26". Keyhole neckline detail offers a feminine touch. Empire waist with adjustable back ties gives a customizable fit. Two front patch pockets to hold your gear. Center back length: 26½". T-shirt inspired v-neck for an on trend look. Deep side entry front pockets store your gear out of the way. Sporty pleated back allows room for growing tummies. Center back length: 26½". Pure comfort front and back stretch panel. Two front and two back hip pockets. Mock fly detail. Side vents for ease of movement. 16" leg opening. Regular inseam: 31½". Flat front full elastic waistband for ultimate comfort. Fully covered elastic jogger ankle gives a sporty, but professional look every day. Two front angled hip pockets and two angled on-seam back hip pockets will hold everything you need. 11" elastic leg opening. Regular inseam: 31". Petite inseam: 29". Tall inseam: 33". Curved mesh v-neck and center mesh panel on back for all-day comfort and breathability. Princess lines for a more flattering fit. 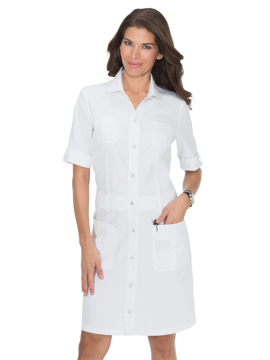 Shirttail hem with mesh trimmed edge for an athletic inspired look. Center back length: 25½". T-shirt inspired v-neck top is soft to the touch. Contrast tri-blend panels on front and back for athletic inspired look. Contrast mesh side panels to keep you cool and comfortable. Center back length: 25½". Stand-up collar with zipper garage for added comfort. Full zipper closure. Front and back princess seams for ultimate fit. Three roomy top loading pockets. Center back length: 24½". T-shirt styled v-neckline created to be comfy and cool. On seam top loading pockets made to hold all your gear. Athletic inspired crisscross back detail. Move-with-you side vents. Reflective logo. 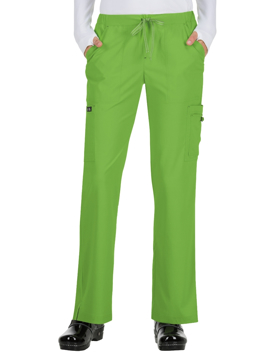 Omni-stretch micro-pique moisture wicking fabric with anti-microbial odor control technology. Center back length: 25½". Branded exposed elastic waist pant with elasticized tie. Two angled hip pockets, plus two back welt pockets and a side cargo with elastic tool tape to store your gear. Side facing action vent. Reflective logo. 16" tapered leg opening. 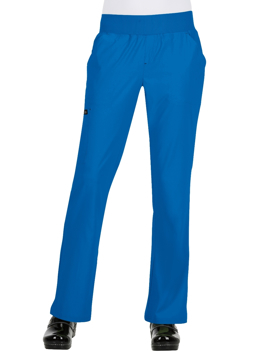 Omni-stretch micro-pique moisture wicking fabric with anti-microbial odor control technology. Regular inseam: 32". Petite inseam: 29½". Tall inseam: 33½". Asymmetrical princess seam mock wrap neckline. Two deep top loading pockets with branded elastic tool tape. Move-with you side vents. Reflective logo. 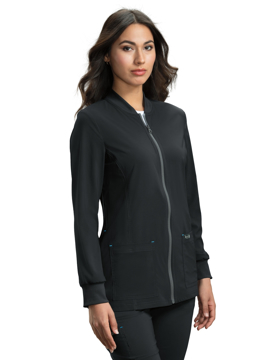 Omni-stretch micro-pique moisture wicking fabric with anti-microbial odor control technology. Center back length: 26". Subtle hint of print using Solid Illusion Geo Tech pattern to give you a fun pop of style. Half elastic back and half drawstring front for maximum comfort. Two front angled pockets plus cargo with additional signature zipper pocket offer incredible security and storage. Slight flare. Side vents for ease of movement. 19" leg opening. Regular inseam: 31½". Petite inseam: 29½". Tall inseam: 33½". 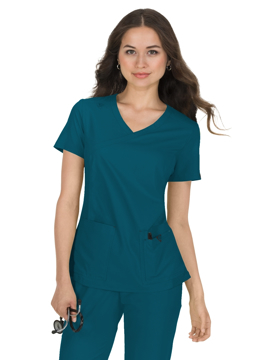 Soft v-neck with triple needle stitching down front and across pocket tops. Princess seams fit to flatter everyone. Two roomy top-loading pockets to hold all your gear. Side-seam hem vents for easy all-day movement. Center back length: 26". Rib collar at neck. Zipper front. Rib cuffs. 2 front pockets. 2 side seam pockets. Bar tack detail. Side slits. Center back length: 28". Elastic waistband with koi logo. Soft, stretchy poly spandex jersey fabric. Athletic styling. Great for layering. Helps keep you warm. Regular inseam: 27". 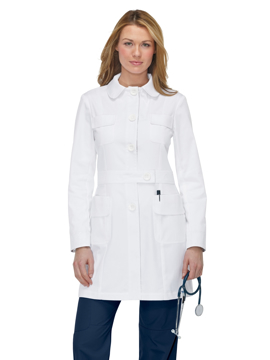 Button front with fold-over tab at waist. 4 front pockets. Princess cut for more shape. Stitched-in belt (front and back). Print facing at placket, neck and cuffs. Center back length: 35¼".